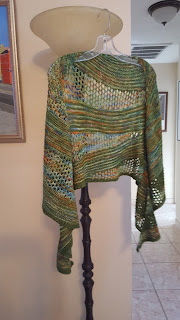 Now that my shawl is complete (yarn purchased during the Orange Blossom Yarn Crawl in March), it is just hanging out in my foyer until I decide if I should gift it to someone or if I'm keeping it for myself. 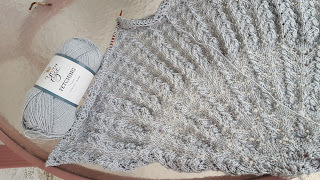 I think I want to make another one of these shawls (pattern is called Nostalgia Shawl on Ravelry). While it was an easy pattern, the lacy part required some attention and I think ripped back those sections quite a few times before I actually got it right. I started working on a crocheted poncho. Ugh! I know you are thinking, "Poncho? Not a good look". I plan to change your mind! The colors are very nice and the crochet is very....holey? Is that even a word? I should have the first panel done very soon and will post a picture. First day of daylight savings time, felt like a million bucks. To have even a few minutes of sunlight at the end of the workday is an amazing feeling. My motivation propelled me into going into the garage, cleaning off the bike, putting air in the (deflated, I'm sorry to say) tires, and taking a spin around the neighborhood. It's a very small step, but at least it is in the right direction. I finished my shawl. Well, it's off the needles. I want to block it but it's acrylic but I was told that you can steam block acrylic. I would prefer to use a handheld steamer but those things are $150 on Amazon. I guess I will have to try it with my steam iron. I have the strangest anxiety. I get anxious that I will never be able to knit/crochet all of the yarn I have in my stash. 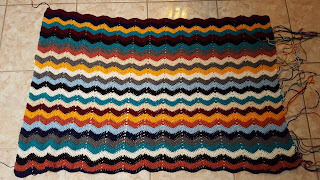 The tiny little part of me that is an optimist, well, she's sure that we can use up all of the bits and pieces with a stash-busting project. However, in the interim, I want to start some real projects - as in sweaters - and you know, that means MORE yarn. The additional yarn is 100% mandatory because you cannot use big box retail store yarn (i.e. acrylic) for your first sweater. Nope. It must be soft, luscious and a natural fiber (maybe wool and cotton? something appropriate for Florida). I have to temper my anxiety of my ever-increasing stash with my desire to push my knitting into new projects. On the weeknights, I've been knitting dishcloths to use up my cotton yarn stash; I had a former co-worker text me and ask me to send her a few. I hope to have at least four of them to her by the end of the week. It's 61°F in Florida. I am trying to wear my hand knits, but now I'm burning up. But my hat is so cute. I'm currently obsessed with knitting hats. Crochet is okay, too. But I found that my gauge in crochet is so way off and I have a better feel for my knitting gauge. Ha! I love how I type that as if I really know what my gauge is. 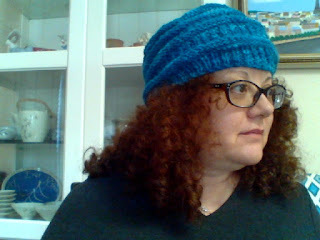 The only thing I know for sure is that I knit loosely and I typically have to go down several needle sizes. I am also working on a scarf, a Missoni blanket, and finishing my cruise shawl. My next project is to make party bunting for gay pride. That's a commissioned work for which I will receive no pay. My latest project is a crochet ripple (wave) pattern from Jan Eaton's book, 200 Ripple Stitch Patterns. The book lists this as one of the easiest of the crochet patterns, so it's perfect for after work or at knitting group. My projects all come down to the level of ease for me. I think it's very pretty. While I did not choose the colors, and I am using a random stripe generator for the colorway, I am really pleased about how it is progressing. Two weeks ago, we welcomed cat number four to our house. For whoever is keeping score, that's felines 4, humans 2. And Mr. Grumpbump did not have a choice, or a chance. 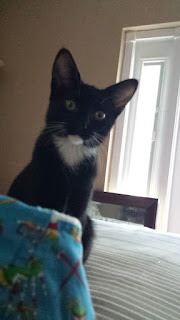 Number Four is a black and white tuxedo female kitten, approximately 2 months old. That makes Mr. Grumpbump outnumbered Five to One in the females vs. males demographic. Mr. Grumpbump was fairly annoyed with me, and he essentially did not want to deal with the kitten. But this story has a good ending. Her name is Flower, after the skunk from Bambi. Also because the white tips of her front paws remind me of petals on flowers. After two weeks, she's got the hang of our schedule and she is allowed to roam the house with the other cats. Delilah and Macy stay away from her because they are either too old or too shy to deal with scampy kitten.